The short answer is yes, kind of. It’s one of the most frequently cited, debated, and disputed food facts: “Did you know Oreos are vegan?” Strangers to plant-based cooking might be surprised that chocolate cookies and creamy frosting don’t contain milk or eggs. But, as those of us with plant-based kitchens know, it’s not far-fetched at all. Here is an abridged Oreos ingredients list: unbleached enriched flour, sugar, palm and/or canola oil, cocoa, high fructose corn syrup, leavening (baking soda and/or calcium phosphate) cornstarch, salt, soy lecithin, vanilla, and chocolate. By most definitions, it certainly looks vegan. But, many vegans swear off refined sugar, some of which is processed with animal bone char. There’s also the milk issue. 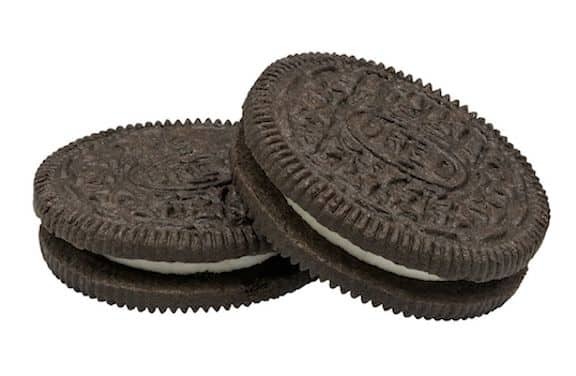 Like many processed foods, Oreos are produced on the same equipment as other, non-vegan products. So, you might be ingesting trace amounts of dairy with your Oreo cookies. Some vegans stay away from these types of food while others leave room for the small error. So, that’s the gist of the “Are Oreos Vegan? debate. However, it begs another question. Some adopt a vegan diet purely for ethical reasons while others are at least partially motivated by health. And if that’s a concern of yours, you might want to take a second look at the unabridged ingredients list. Oreos are made with highly processed ingredients, and chock full of sugar – three cookies contain 14 grams of sugar, or 2.95 teaspoons. That’s half the recommended daily allotment. If you want to stay away from processed ingredients and high fructose corn syrup, then opt for an organic, but still vegan, cookie like Newman O’s. Organic sugar isn’t refined with bone char, which is another big plus. But, a word of warning: organic products can contain as much sugar as their highly processed alternatives. Three organic Newman O’s cookies contains 16.5 grams of sugar – even more than Oreos. So, if you’re watching your sugar intake, indulge in packaged cookies in moderation if at all. Instead, try low-sugar or sugar-free dessert recipes from VegKitchen. Thanks! While I personally don’t eat Oreos… I’m one of those weirdos that don’t like chocolate… I do have to wonder..is this too picky? What I mean by this is that nearly every boxed or bagged product I use has the warning that it is manufactured in a facility that processess nut, eggs, milk, etc. My pasta, rice, flours, etc all say that. While cross contamination can be an issue for those with severe allergies, is it really something to worry about as a vegan? If someone eats anything that is processed in a facility that also processes non vegan foods am I or them no longer vegan? Many of the cheaper brands have these labels as well. I don’t want milk in my food so I wonder…..how is it processed? I did some research and found that the conveyor belt, equipment, etc are all washed and serialized between products but because of allergies they have to add it to the label. The actual chance of cross contamination is so small that I’m not going to get upset and call someone a non vegan for eating Oreos. Jenna, some people are so severely allergic to the allergens you mention, that even a few particles can make them sick. Personally, I don’t think that someone who eats vegan foods from a non-vegan facility is no longer vegan. It’s like going to a non-vegan restaurant and ordering the vegan option. We’re still making a statement and doing the best we can!